Get a FREE Malissa KISS Super Black Ultra HD Eyeliner, for every 2 bottles of either KISS White Me Up, Snailwhite ! Limited to only 1st 100 customers! 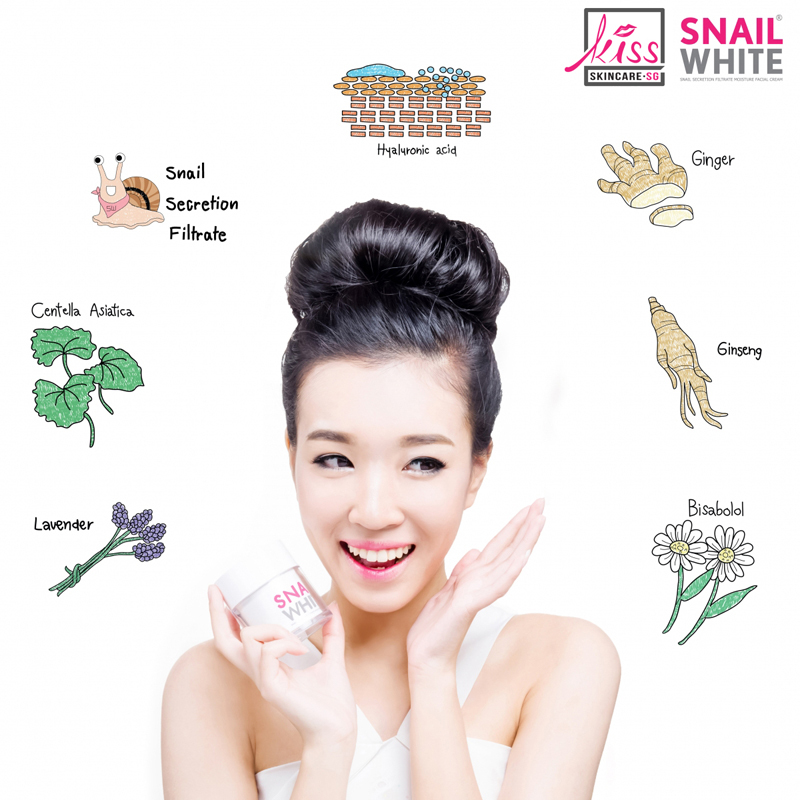 The Bestseller Natural Snail Secretion Filtrate facial cream in Thailand, Singapore, Malaysia and Hong Kong. It is a lightweight snail secretion filtrate moisturizer recommended to be used twice daily, day and night. It helps to achieve a brighter skin with its’ exfoliating properties, repairs damaged skin and regenerates skin cell turnover rate. P/S: Average usage of a bottle is around 2 to 3 months depending on Individuals. Individuals’ result may vary. n general, SNAILWHITE Facial Cream is suitable for all skin types, both females and males. It is great for individuals who want a smoother, brighter and firmer complexion. Have you guys heard of how beneficial SNAIL SECRETION FILTRATE is? Just this ingredient alone is a combination of 6 other natural ingredients which treat most of the skin problems most of us are facing everyday! To name a few, Collagen, Elastin and Glycolic Acid can be found in Snail Secretion Filtrate! It enhances the regeneration of our skin cells turnover rate and strengthen skin barrier against harmful pollutants! With Snail Secretion Filtrate and other main ingredients, it makes the cream rich but yet easily absorbed onto skin! Wonderful! Are you facing some of the skin problems below? You might want to give this tub of cream a try! Off to a smoother, brighter and supple skin! SNAILWHITE Facial Cream is a light-weight moisturizer which focuses on the 5 Rs’ : REGENERATE RECOVERY REPAIRING RESTORE RENEW. To add on, it makes application easy and convenient! It comes in a vacuum pump tub which dispenses only sufficient amount you need, gone were the days of messy and hassle experience from digging into your moisturizer! TOP INGREDIENTS OF SNAILWHITE CREAM THAT MAKES IT SO WONDERFUL! HOW TO USE SNAILWHITE CREAM IN A FEW SIMPLE STEPS?